Home Tags Posts tagged with "City Layout"
Update: This layout is an excellent beginner guide for players starting out. 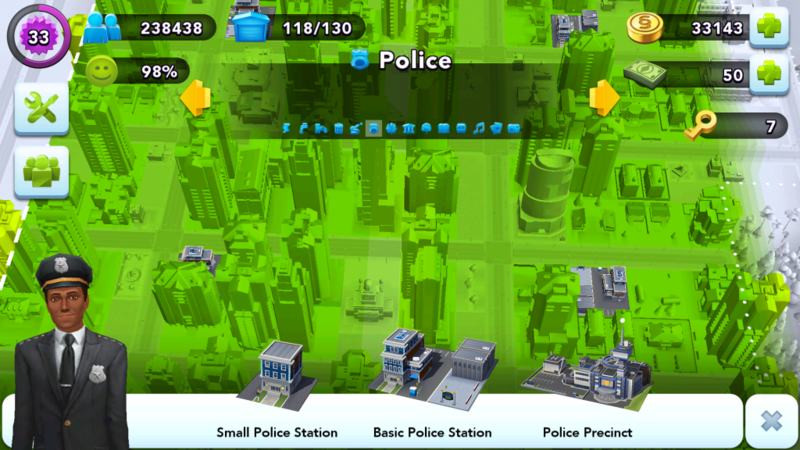 However, I have progressed to the point where I can of re-create my city following this guide here. I will update this guide if I return to this layout. Update 2: We’ve recently updated our hack tool page with a link to the first working software we’ve found! Get it while it still works! Click here to visit the page. Hello fellow Mayors! 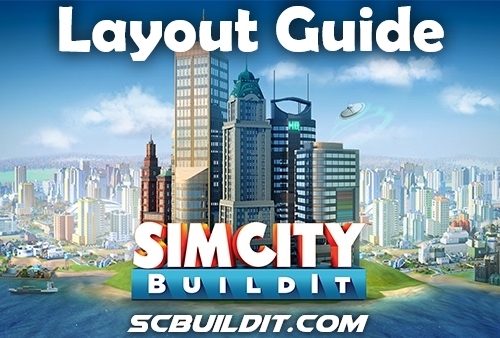 It’s vortexrap, one of the moderators of /r/scbuildit and co-creator of scbuildit.com posting today with my first SimCity BuildIt Layout Guide. I’ve been playing for about a month and a half so my city is relatively developed (but theres always room for improvement) and I’m here to share my city’s layout. This guide uses some terminology that I've used but it might not be familiar with if you are a beginner or first time reader, please read the terminology section here. 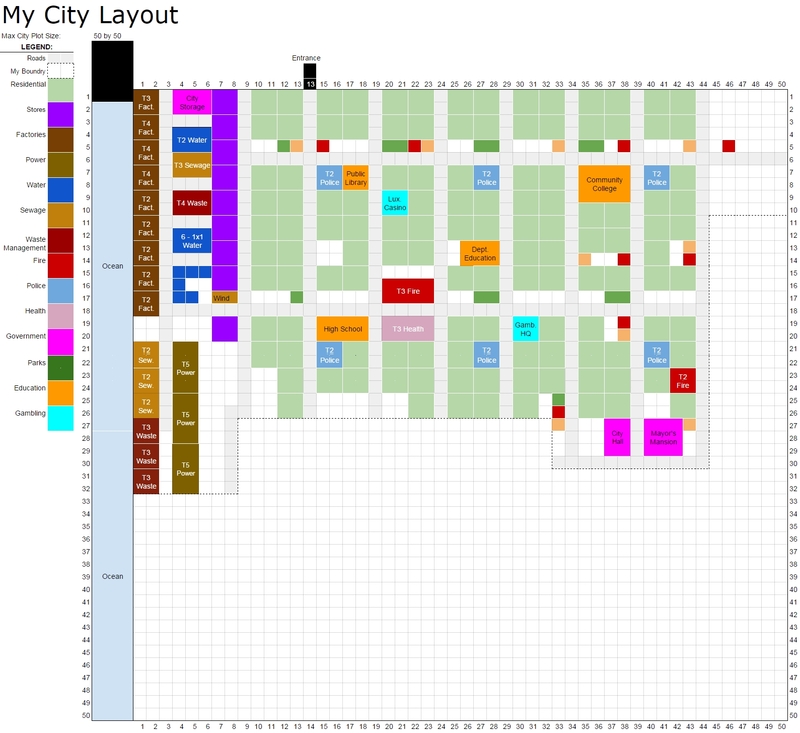 If you want additional in-depth info, please read our page on city layouts here. Without further ado, lets begin! First up. I like using 4×5 grid sizes. it allows for 4 residential zones as well as a strip that can be used for parks and services. 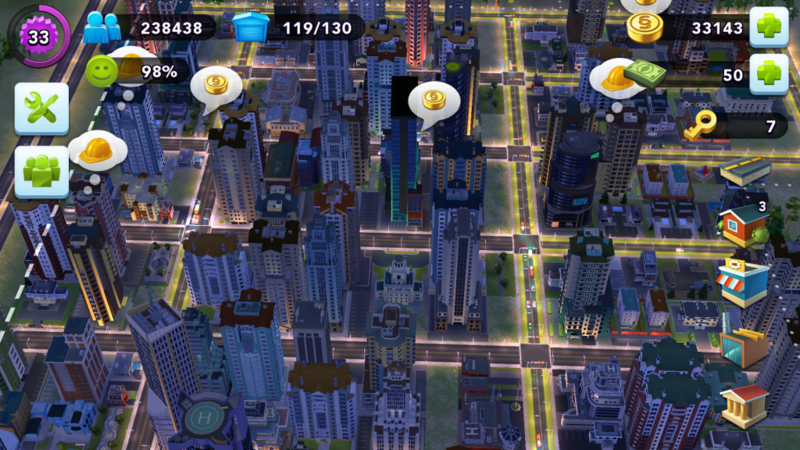 I then recommend a 4×11 city grid. 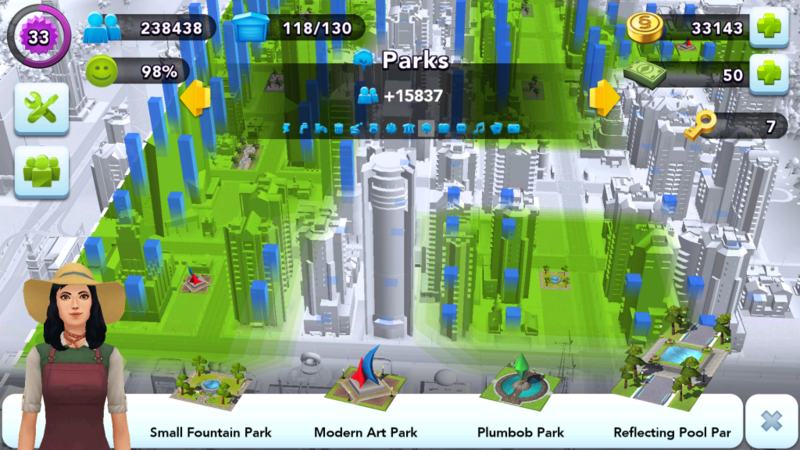 You can fit 10 residential zones as well as a strip that can be used for parks and services. I chose this grid style because I prefer less roads if possible. You can adjust this grid by having a road run horizontal at row 6 (Grid Area 2) and you now have the standard 4×5 grid to work with. I’ve extended this grid all along the eastern (left) side and set up my industrial area along the coast to the west. This is an area I am particularly proud of. Along the bottom, I have set up my factories right along the edge of the map. Along the top I have set up all my stores (I’ll occasionally get some speech bubbles from residences saying that they are happy to living close to stores). 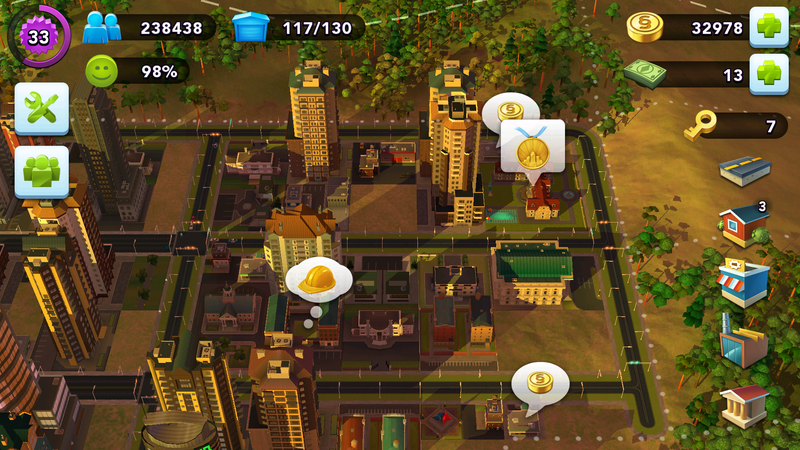 In this middle area, (a 3×2) I’ve arranged my services (water, sewage, waste management). I was shooting to maximize every piece of land in this area and played around with many different layouts and configurations until finding my current layout. I have top tier (no pollution) services placed here. You may have pollution if you place dirty buildings here. 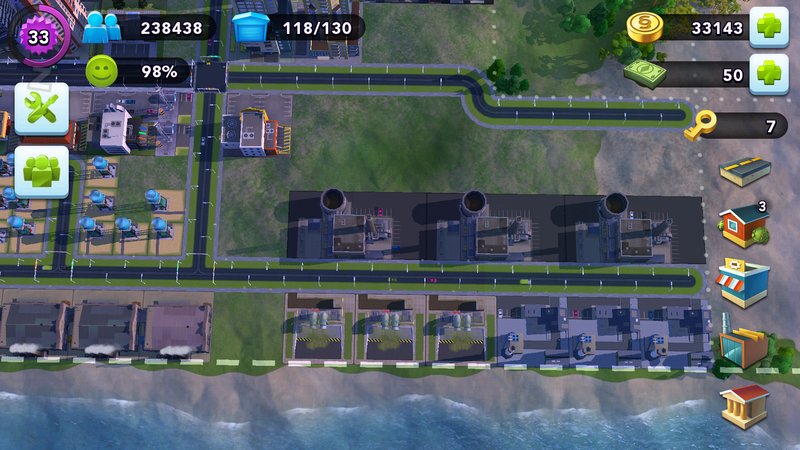 My extra 1×1 water towers and wind turbines are placed here temporarily until I need the space. I've got room to expand to the right and a place to put a new factory if I am able to at higher levels. Here is another zoomed out view. Oil power plants are on the top. I’ve got old T2 Sewage buildings as well as old T3 waste management buildings. These all generate dirty areas which is why I have placed them as far as possible from residential areas. 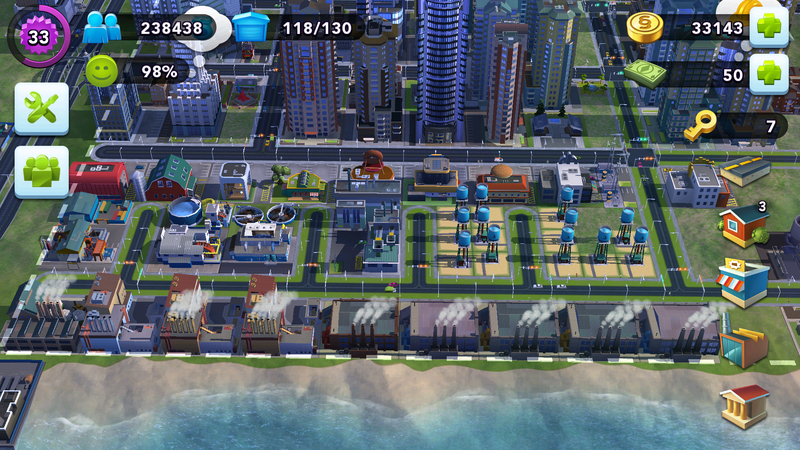 Here is my utility service buildings that generate pollution. 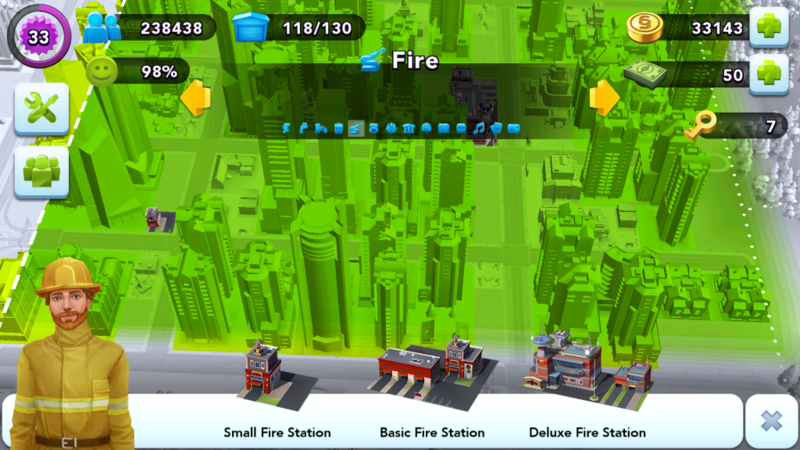 Separating your polluting buildings is vital to keeping Sims happy. See our in-depth section on Utilities here. 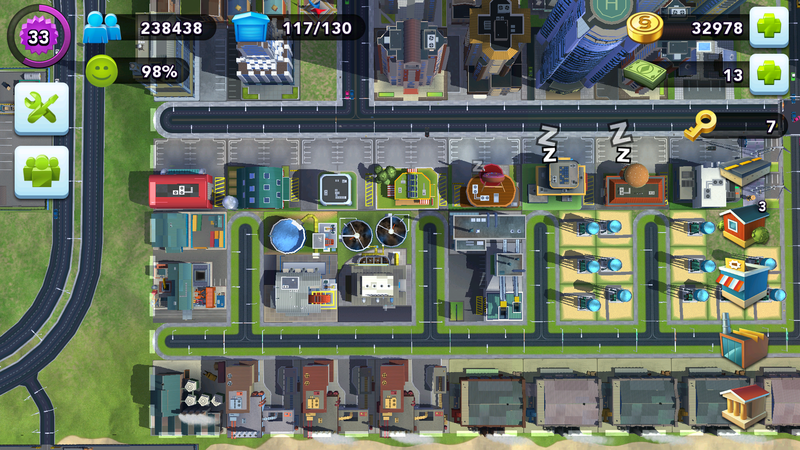 I am using a mix of high-tech factories, mass-production and basic factories and you can see that the pollution area does not reach my residential zones. 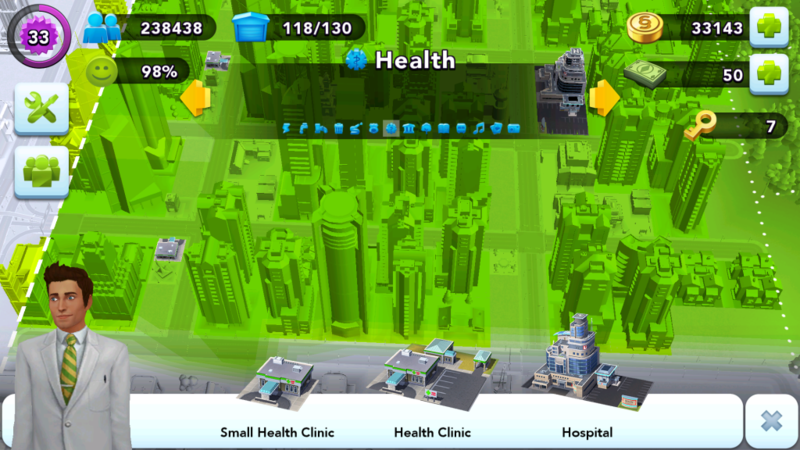 Even when placing the lowest tier factory (which has the largest dirty area) along the edge, pollution only reaches the road (still does not affect sims). Purchase the High-tech Factory. Don't buy the Nano-tech. 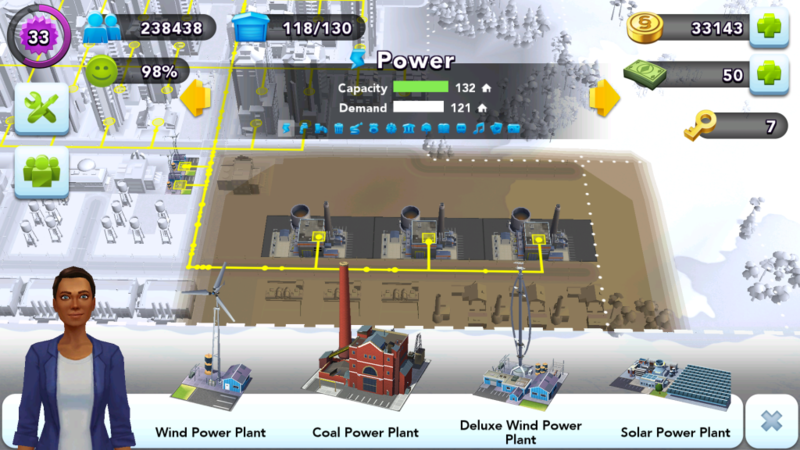 It offers no other advantage to a high-tech factory aside from generating no pollution (But it costs §30,000 more) You will have a dirty area in your city for good portion of the game and as such, you can place these factories around here. 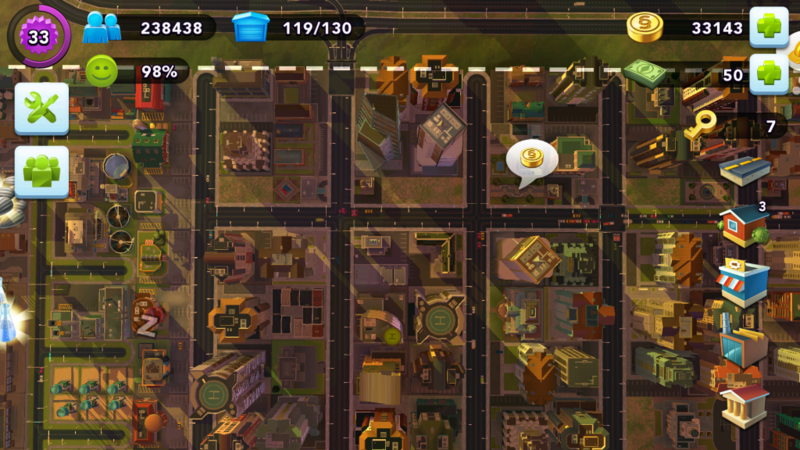 Placing oil factories at this location generates a dirty area that only reaches the road (does not affect sims). Placing coal along the edge of the map (where my waste and sewage are) prevents the dirty area from reaching sims, but placing coal where my oil plants are currently DOES put pollution my residential area. Buy coal and oil factories. Then fusion or nuclear depending on your city. I have some old T2 sewage buildings placed here. Pollution does not reach residents. 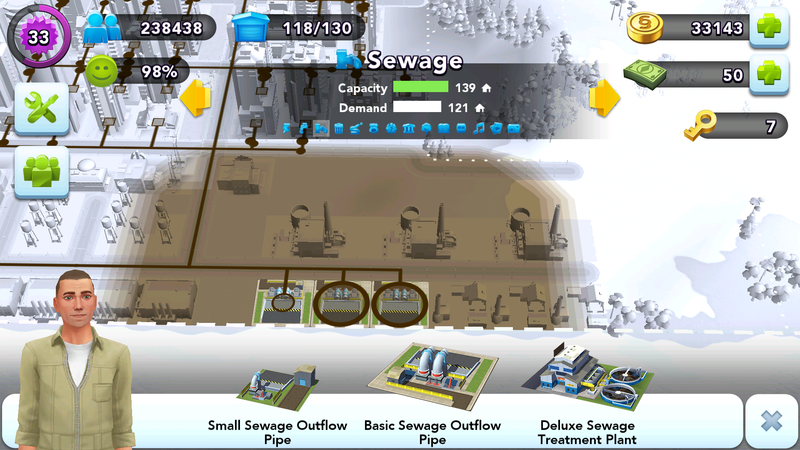 Placing the T1 sewage along the edge will cause pollution in Sims. Buy the T2 sewage building until you can afford the T3. This is the area I will need to improve on. 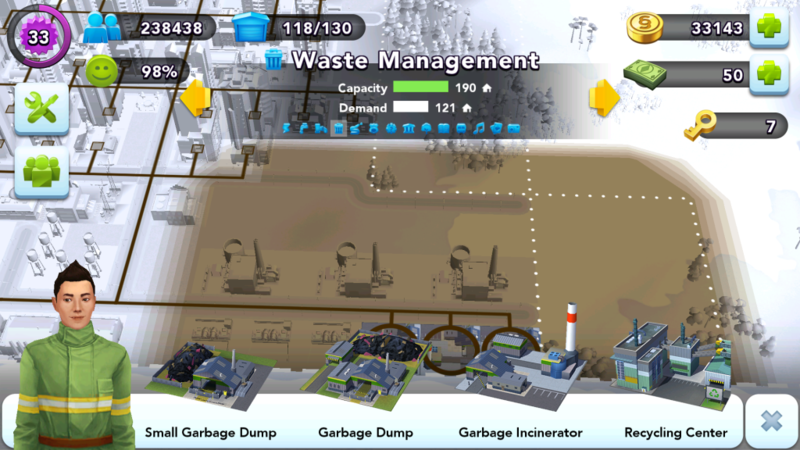 My T3 garbage building puts pollution past the road and into residential areas. 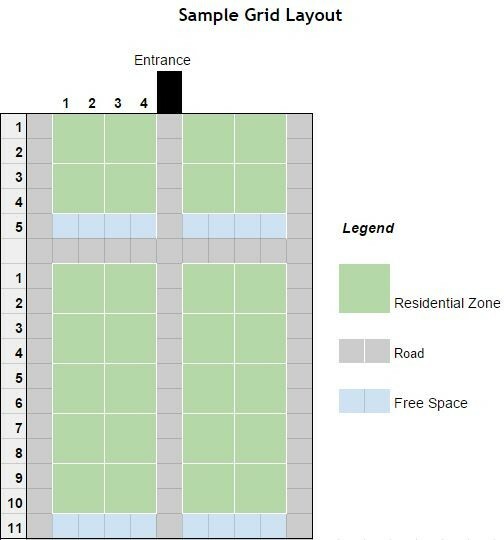 I’m leaving those zones blank and will either upgrade to a T4 building or simply keep moving my old waste buildings around. See our in-depth section on Coverage Services here. Here is a view of my fire service. I have T1 service lined along the left edge and a T3 building in the center. 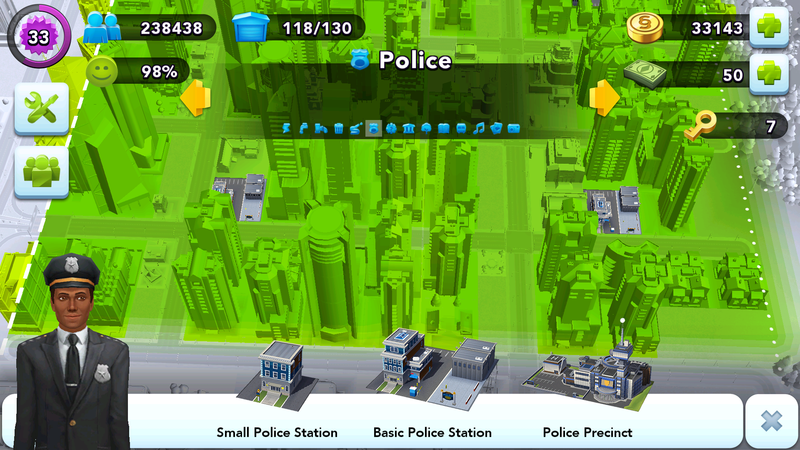 I’ve organized my T2 police buildings like this. Coverage is a perfect fit with no overlap. Similar to fire, I have the T1 Health lined up along the left and the T3 Health in the center. I have additional coverage on the right for additional expansion. This is what I would consider the “endgame” of SimCity Build It so my city is still lacking the transportation, entertainment, and landmark specializations. You need a minimum of 2 specializations to result in the skyscraper and luxury homes. Read up on wealth and land value here. Overlapping coverage is alright, as multiple boosts 'stack' – that is it applies all specialization effects currently active on the residences. Avoiding overlapping coverage additional specialization boosts to new uncovered zones, so the decision is really up to you. I would spread out your specializations and have at least 2 covering most of your residences. My current layout leaves a strip without Park service. I’m still playing around with different layouts but I believe I will end up placing 2×2 grid sized parks to fill out empty spots eventually. This was my first specialization purchase (aside from parks). No real tips/comments on this section. This was my second specialization purchase (aside from parks). 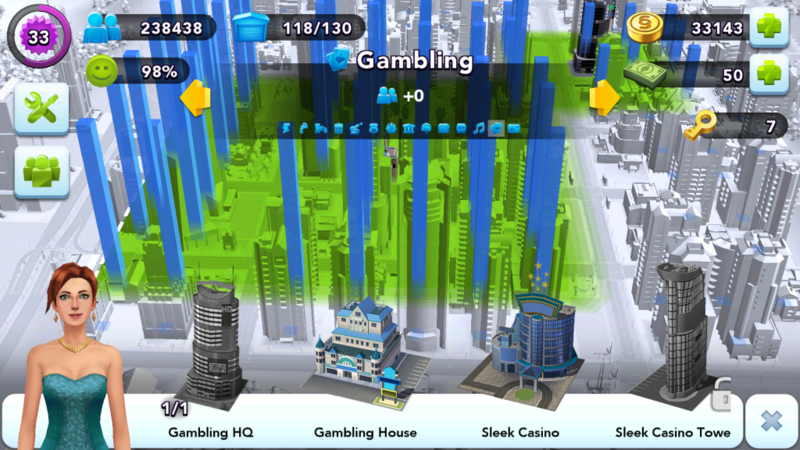 Gambling offers the lowest key price per building of all the specializations. I highly recommend this as a specialization choice. 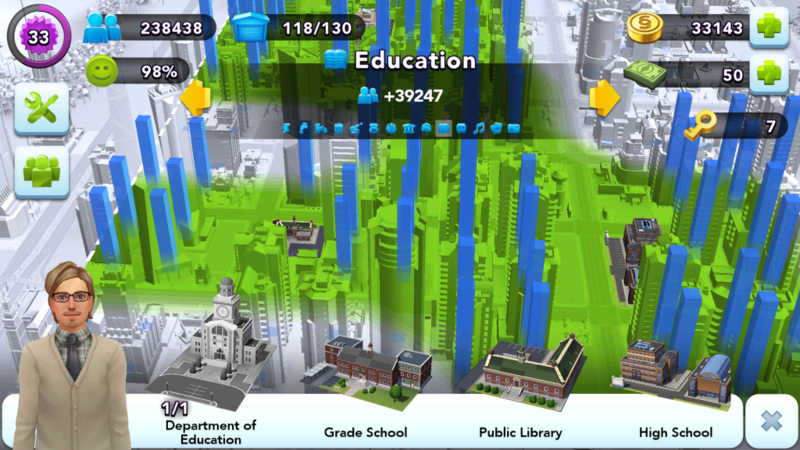 I’ve placed my government buildings up here to avoid taking up space in my ‘main’ city area where I have several specializations and boosts active. I will continue to move these buildings farther out as I expand. City Layout – Northern View. Thanks for reading my first ‘guide’ (one of many to come) for scbuildit.com! Hope this post helped plan your new (or even existing) city and if you liked this guide, spread the word so more Mayors can improve their cities. Please leave any comments or suggestions here and at the forum. Also check out the subreddit /r/scbuildit, a growing community of fans of the game.